This leading-edge column technology is ideal for applications that require faster run times, such as high-throughput screening, fast process monitoring, and fast method development. In fact, Agilent High Efficiency GC columns can reduce your sample run time by 50% or more without compromising resolution. 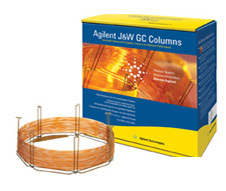 Unlike other manufacturers' 0.1 mm id columns, Agilent's 0.15 and 0.18 mm id High Efficiency Capillary GC columns are compatible with all standard-pressure capillary GC and GC/MS instruments – without expensive high-pressure modifications.